Irish officials have arrested four known gang members in a classic car scam that primarily targeted elderly collectors, the country’s national police force said in a news release. The An Garda Síochána said the scammers were arrested following an operation in Rathkeale, County Limerick. The Irish Times reported all four were linked to Irish gangs and had previously been involved in numerous crimes, primarily theft cases. The scam worked two ways: The scammers allegedly would agree to purchase a classic car, but would only pay a fraction of the agreed price before taking possession. The Irish Sun reported the scammers would call people who lived on rural properties where a classic car was stored and ask if the vehicle was for sale. An anonymous source told the Sun that the scammers would then pressure the victim into selling. “Two or three of them will show up and offer large sums of money to these people and they can be quite aggressive about it,” the source said. “If the mark gives in, they’ll either disappear without paying or use distraction to pay just a small part of what is owed. In other cases, they would agree to sell a certain classic car to a buyer for a price, but deliver a far inferior vehicle from the one pictured online. The Garda did not say how much money buyers lost. The scam primarily targeted people in Ireland, but there may be victims in other countries. Garda officials said the scammers obtained about 20 cars worth a total of €360,000 ($406,000) by pressuring sellers, including top British marques such as Bentley and Rolls-Royce dating back to the 1930s. And that’s likely not the final number. Officials believe more people were victimized and encouraged them to come forward. 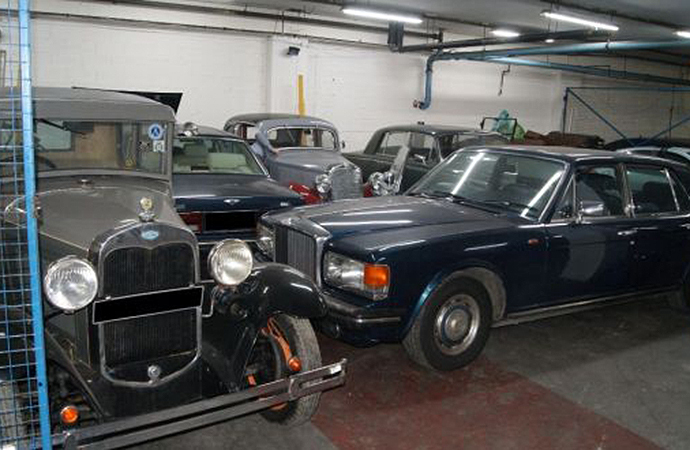 “From enquiries to date, I believe there may be more victims across the country who have been deceived during a transaction involving a vintage or classic car,” Detective Superintendent Michael Mullen of the Garda National Bureau of Criminal Investigation said in the release. It would be interesting to see how much these thieves get prosecuted for. I’m assuming they’ll each get prison time; I wonder how much of a sentence Irish law allows for? Crimes like this are becoming increasingly common as the market for classic automobiles grows in popularity and value. Buyer and Seller beware! Bo need to got to Ireland to find scammers, there are a lot over here… I can give you the example of the site "hotclassicdeals.com" which disappeared these last days where you could find very nice classics at bargain prices. Both websites were located out of the country and recently created. or bank checks can be stopped once buyer gas possession of car. Takes 3 days to verify funds are deposited in my account. Not just available in his. I paid for 1959 ford Galaxie that’s never received,after I sent the money they emailed me and said that they wanted me to send more money for shipping, I new that I was scam, reported it ,they had a lead on them,but I never herd any more. Only accept a wire transfer or Western Union (at any Walmart). I sold a car to someone in Sweden off craigslist. I thought it was a total scam but it was not. I learned that a fake wire transfer is a federal crime and traceable. Use a bank account with very little money in it, in case they are sophisticated enough to drain the account. (Unlikely if they are that tech savoy they have better targets) It clears in a day and puts the burden of trust on the buyer.